Not magic at all of course, but a consequence of the fact that substance use problems are closely related to other problems which often develop at early ages when substance use is just not on the agenda. The 2010 English national drug strategy and corresponding public health plans seemed to recognise this, breaking with previous versions to focus attention on early years parenting in general, and particularly among vulnerable families. Though studies are few compared to approaches such as drug education (1) in schools (for which, see this Effectiveness Bank hot topic), this renewed emphasis on the early years has a strong theoretical rationale and some research backing. Child development and parenting programmes which do not mention substances at all (or only peripherally) have recorded some of the most substantial prevention impacts. Though mainly targeted at the early years, some extend to early teenage pupils and their families. The rationale for intervention rests partly on strong evidence that schools which develop supportive, engaging and inclusive cultures, and which offer opportunities to participate in school decision-making and extracurricular activities, create better outcomes across many domains, including non-normative substance use. As well as facilitating bonding with the school, such schools are likely to make it easier for pupils to seek and receive the support they need. Understandably, such findings do not derive from random allocation of pupils to ‘good’ versus ‘bad’ schools, so are vulnerable to other influences the study was unable to account for. More convincing, if more limited in intervention scope, are studies which deliberately intervene and test what happens among young people randomly allocated to the focal intervention versus a comparator. An early example was a seminal Dutch drug education study of the early ’70s. So profound was its impact in Britain that we have analysed it in detail, contacting the original author. The surprising findings are outlined below. The Dutch study involved 1035 Rotterdam pupils aged 14–16 years whose 20 schools were allocated to one of four sets. Two sets ran programmes delivered by outside experts, who attempted to ‘inoculate’ pupils against illegal drug use – one by stressing the dangers and moral dimensions of drug use, and the other by filling gaps in pupils’ knowledge which were presumed to underlie drug use. The third programme applied a person-centred approach; led by their usual teachers, pupils were given the opportunity to discuss problems of adolescence (rather than drugs specifically or exclusively) over 10 weekly one-hour classes. The fourth set formed a control group, whose pupils received no specific programme; measurements of their knowledge, attitudes, and use of drugs could be used to benchmark the impacts of the specific interventions. Fewer pupils in the person-centred group (2.6%) went on to try drugs than those in the warning group (7.3%), the information group (4.6%) and the control group (3.6%). The results started to unravel the logic that dominated drug education in the Netherlands, the UK, and elsewhere. Educators had to face the possibility that warning of the danger of drugs could in itself be dangerous. Julian Cohen, the author of several well-known drug education packages, observed that “fear arousal was not only ineffective but sometimes counterproductive”. According to the research author Dr. Willy de Haes, who had been in touch with the Scottish Health Education Group, there was resistance to these findings informing policy change in Britain. The Thatcher government was committed to a “hard-hitting campaign featuring frightening images on the theme that ‘drug use leads to death’ ”, delivering in the 1980s an explicitly anti-drug “Heroin screws you up” campaign. Successive governments however moved away from the scare tactics exposed as ineffective in the 1970s – UK Government policy between 2010 and 2015, for example, included “supporting children in the first years of their life so that we reduce the risk of them engaging in risky behaviour (like misusing drugs) later in life” and “providing accurate information on drugs and alcohol through drug education and the FRANK service” (FRANK is a national drug education service, providing friendly, confidential drugs advice). 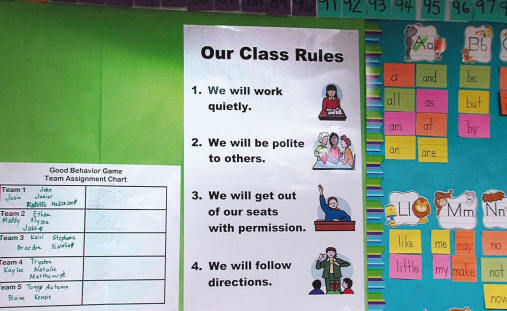 Among the most prominent and promising of current approaches is the Good Behaviour Game classroom management technique for the first years of primary schooling. Well and consistently implemented, by age 19–21 it was estimated that this would cut rates of alcohol use disorders from 20% to 13% and halve drug use disorders among the boys. With four simple rules ( illustration), the Game seeks to create pro-social attitudes among pupils and a positive learning environment, helping in the short-term to improve children’s behaviour and their engagement in school, and in the longer-term, improve educational attainment and increase resilience. Mentor, a charity specialising in the prevention of drug and alcohol problems among people, is currently running a two-year trial to measure the impact of the Good Behaviour Game in UK schools. Click here to see what pupils and teachers participating in this trial think about the Game. Findings demonstrating the success of the Game (1 2 3) appear to support the theory that early and continuing aggressive, disruptive behaviour is a precursor to the development of drug use and other externalising behaviours (such as high-risk sexual behaviour). By young adulthood the most significant impact of the Game on drug use and dependence disorders has been found among males who throughout their early–mid school career were more aggressive, disruptive. The same programme has been combined with parenting classes, leading to reductions in the uptake and frequency of substance use over the next three years. Other examples include a study in Norway which raised the intriguing possibility that taking measures to effectively reduce bullying in schools could help prevent some of the most worrying forms of substance use, and the Positive Action programme which focused on improving school climate and pupil character development. In Hawaii and then the more difficult schools of Chicago, Positive Action had substantial and, in Chicago, lasting preventive impacts. In Britain perhaps the best-known programme aiming to help generate healthy family development is the version of the US Strengthening Families programme aimed at young people aged 10–14 years, which in the early 2000s impressed British alcohol prevention reviewers. It features parent-child play sessions, during which parents are coached in how to enjoy being with their children and to reinforce good behaviour. At first the accent is on building up the positives before tackling the more thorny issues of limit-setting and discipline. Though the potential seems great, later research in the US has not been wholly positive, and earlier results were derived from a minority of families prepared or able to participate in the interventions and complete the studies. A recent study in Poland (a large randomised controlled trial) also found no evidence for the effectiveness of Strengthening Families on the prevention of alcohol or tobacco use at 12- or 24-month follow-ups. • changing the code of behaviour. The prevention activities discussed above ultimately seek to reduce ‘risk factors’ for harmful substance use (attributes or conditions that increase level of risk) and bolster ‘protective factors’ (attributes or conditions that mitigate risk), by intervening at an early stage to modify the immediate (personal, family, school) environment of young people and the way that they interact with it. This focus on children and their families as the ‘site of the problem’ has shown success, but our gaze should not merely be fixed here. Poverty has an enormous burden on people’s lives, and in both direct and indirect ways is linked to the development of substance use issues (1 2). These “structural disadvantages, limited opportunities, alternatives and resources”, as academic Julian Buchanan puts it, signify another layer of preventative work for us to engage with – a broader way of preventing substance use problems, without focusing on substance use. In the US, the Strategic Prevention Framework guides substance use professionals to bring about population-level change by addressing the “constellation of risk and protective factors associated with substance misuse in [any] given community”. In this way, they argue, they “are more likely to create an environment that helps people support healthy decision-making”. Although “concentrating upon individual motivation and psychological strategies for change are helpful and important components” says Buchanan, “the discrimination, isolation and powerlessness faced by many problem drug users must be understood and incorporated within a social model of problem drug use”. The present hot topic focused on those preventive impacts from school and parenting initiatives which are not about substance use at all, but about creating environments at home and in school which foster psychologically and socially healthy child development. Isolating such studies is not possible via our normal search facilities, so we have specially identified and coded them. They may prove to be the future for drug prevention, as traditional drug education struggles for credibility as a prevention tool. See how this future is shaping up today by running this hot topic search. HOT TOPIC 2016 Should we start prevention in the cradle?